A round up of simple vegetarian summer dishes that elevate peak-season produce. 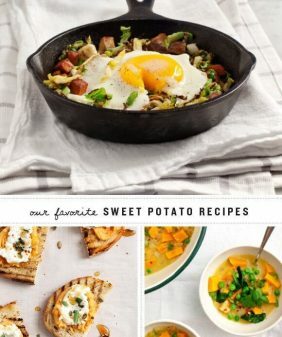 Find ideas for delicious soups, salads, pastas, sandwiches, and more! 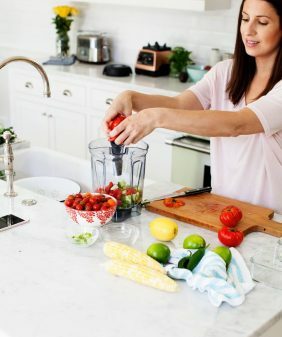 This is how I feel about summer cooking: I don’t want to spend tons of time in the kitchen, but I DO want to make meals at home using all of the seasonal produce that is so stunning at this time of year. The nice thing about summer cooking is that since the ingredients are so wonderful, you don’t have to do much to them in order to make a great dish. This is the easiest recipe in this post! 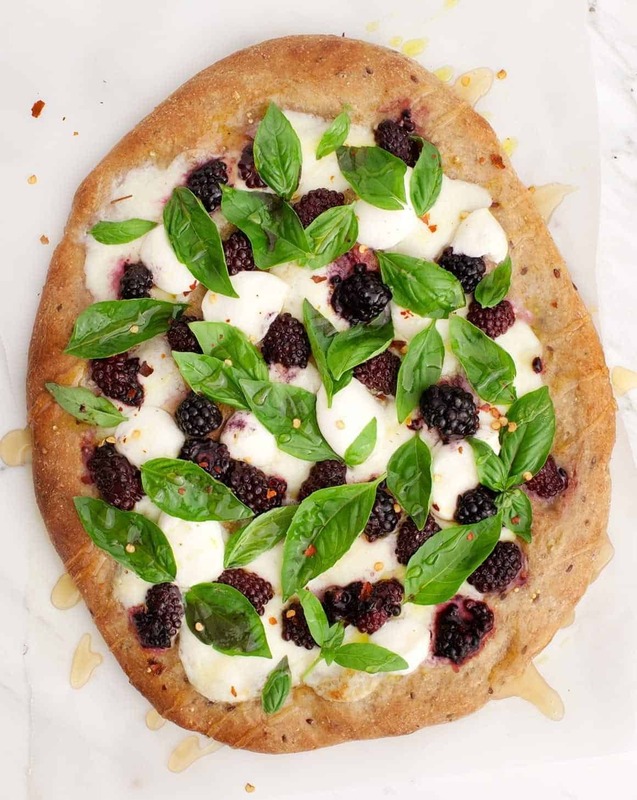 Because blackberries and basil are such flavorful ingredients and make an A+ combination, the ingredient list is super minimal. This one gets rave reviews by my family. 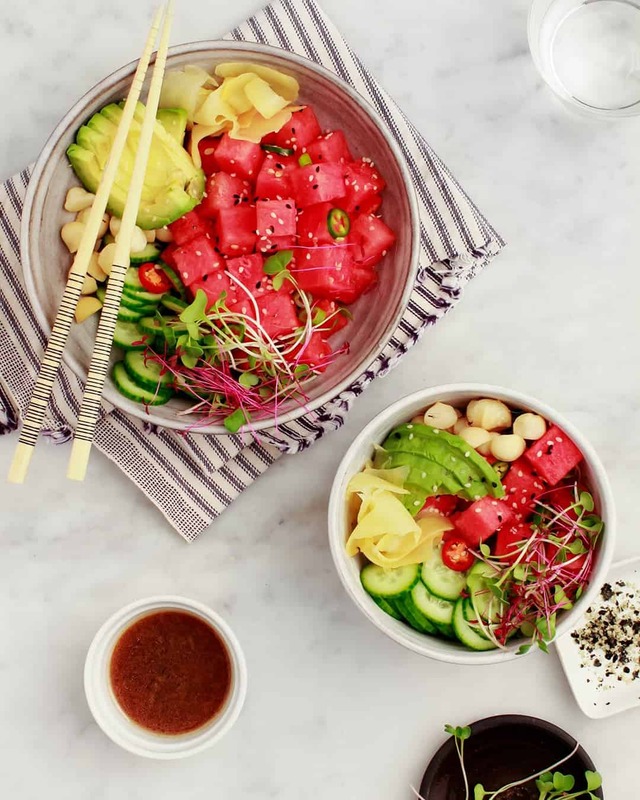 I love how the bright pink watermelon in these bowls mimics the look of sushi-grade fish, but you end up feasting on refreshing summer produce! Tangy sesame-tamari-lime sauce and poke toppings like pickled ginger fill these bowls with flavor. This riff on tabbouleh is perfect for summer picnics – it’s super easy, and it packs up well if you make it in advance! I love the chewy texture of the tart cherries alongside the freshness of parsley and mint. This is the recipe to make if you have show-stopping local tomatoes. 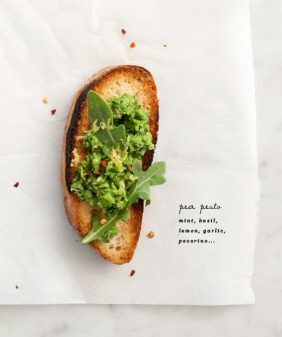 Elevate them just slightly with creamy mozzarella and bright mint pesto, and you have my ideal summer meal. This recipe stars one of my favorite parts of summer: sweet corn! Simply grill the corn with green beans, and toss them both with cherry tomatoes, cilantro, and a zesty tomatillo salsa! Stuff the veggie filling into tortillas, and enjoy! With its cool, refreshing tang, gazpacho is one of my all-time favorite summer dishes. Don’t worry, the watermelon in this soup doesn’t make it taste too fruity, but it adds a subtle sweetness to balance and accent the flavors of the other fresh ingredients. With peaches, corn, fresh tomatoes, and herbs, this dish is packed with summer flavor. Plus, it’s an easy one-bowl recipe and super flexible. If you don’t like one of the ingredients, swap in something else or leave it out altogether! Since corn and gazpacho are two of my favorite things, why not corn gazpacho? This soup couldn’t be easier – all the ingredients are blended together – and it gets more flavorful as it sits in the fridge! These stuffed peppers are a great vegetarian main. Serve them with an herby yogurt sauce or top them with cheese for a heartier meal. 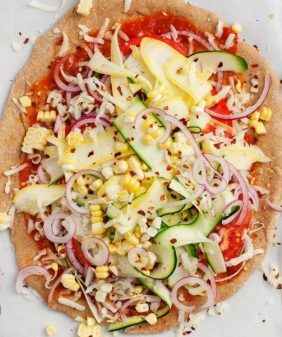 Again, the filling here is flexible, so customize it with your favorite veggies and grains! This recipe is from our cookbook, and I love that it lightens up traditional lasagna without sacrificing flavor. Planks of zucchini sub in for half the noodles, and a zucchini-basil-lemon vegan ricotta takes the place of the traditional cheese filling. 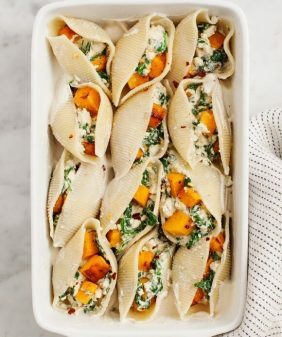 I love the sweet and spicy combo that comes from layering fresh peaches with the creamy green chile sauce in this recipe. Refried beans, cotija cheese, cherry tomatoes, and pepitas finish these tostadas off, making them a light and flavorful option for when you have peak-season peaches. This version of caprese salad adds strawberries for extra sweetness, avocado for creamy texture, and pecans for a little crunch. With these add-ins, this simple salad is a crowd pleaser even without perfect tomatoes! Another taco recipe! I love how tacos let summer produce shine without a lot of cooking. Crispy cabbage and sweet mango are the stars here… add a little spicy sriracha mayo, and you have a 10/10 dinner. This is the simplest pasta recipe of them all: add the veggies, pasta, and water to a pot, bring to a boil, and in less than 15 minutes you have a full meal! The starches from the pasta create a sort of creamy sauce in this recipe that’s amped up with lemon juice and zest. When tomatoes are in top form, it’s BLT time! The “B” in this recipe is a simple white bean spread full of delicious tang from lemon and capers. Top this sandwich with smoked paprika for a hint of bacon-like flavor! 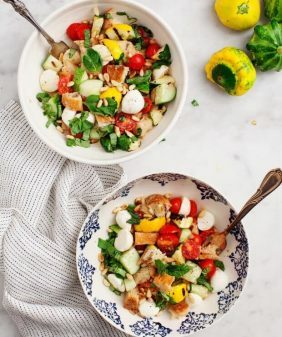 This is one of my family’s favorite recipes on the blog, and it’s a good way to polish off your excess zucchini in the summer. The chocolate chips on this bread make for a heavenly combination with the cinnamon and zucchini. With my family around, I didn’t have many leftovers, but if you do, this bread freezes well! So to keep this on the short side, let’s just say that all those taco recipes you listed have just gone into my bookmarked folder of “recipes to try”! There is just something about summer that screams fresh veggies and beans combined into one and what do you get, tacos! I think they are an easy a quick meal that doesn’t really require much thought because whatever you put in them will end up tasting delicious. In all honesty, that black berry pizza looks very interesting, however, I trust you when it comes to new and fun recipes so I’m going to give it a go this weekend and let you know how it goes! Thank you very much for sharing this informative post with us. I want to make them all. They look so amazing.